Sierra Nevada/Russian River Brux | Drink. Blog. Repeat. One of the things I really like about collaboration beers is that it gives people the chance to sample an offering from a brewery they might not otherwise get to try. Recently, there’s been the New Belgium/Lost Abbey Brett Beer collaboration, and of course all the collaboration offerings from Stone. In South Carolina, we don’t get Lost Abbey or most of the breweries Stone team up with, so it’s nice to say you’ve tried something that at least has the name of an out-of-reach brewery on it. And while ‘round these parts we get plenty of stuff from Sierra Nevada, we’re a long way away from anywhere that stocks Russian River. (Although that hasn’t stopped me from getting my hands on most of their sours and Pliny the Elder.) 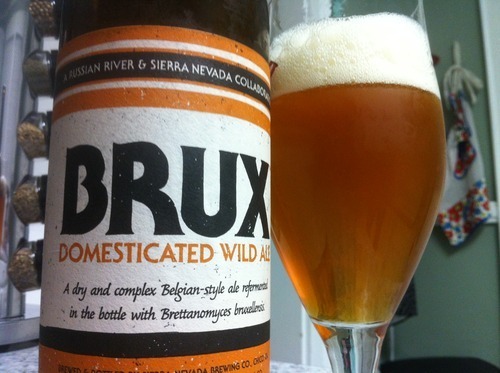 Fortunately, we can now count Russian River among the ranks of East Coast beers thanks to Brux, the “domesticated” wild ale they cooked up with Sierra Nevada. Coming in at 8.3% and bottle conditioned with Brettanomyces bruxellensis, Brux is a cellerable sour that promises to develop nicely over time. But I have little patience, so let’s get into it. Brux pours a gorgeous sunset orange color that’s beautifully clear. There are a couple fingers of a head on top but it barely lasts long enough to appreciate it. No lacing on it but some fairly strong alcohol legs. A big punch of Brett funk hits you first on the nose, exactly what you’d expect from a beer that trumpets the yeast of its label. It smells very effervescent, bubbly, light and crisp. There’s a big yeasty note to it and a chewy breadiness as well. That’s topped with a touch of sweetness, a bit of grass and a wisp of peppers, apples and lemon. On the front of the tongue is a big pinch of tartness. The carbonation completely washes over your mouth and pops open the taste buds. It’s got a medium but bubbly mouth feel. The tartness is very mild on the back at first but then explodes into this sweet yeast, along with some light raisins, green apples and grapes. There are very mild hints of apricots, bananas, honey and some citrus. It’s topped with a nice dry finish on the back and a slight white wine note. Sours are a new territory for Sierra Nevada, but the folks at Russian River know what they’re doing when it comes to making a great tart beer. Brux is a departure from many beers in the style as it’s pleasantly tart on the front, but settles more on the back, stopping just shy of being lip-puckingly sour. The “domesticated” part of the name makes sense when you look at it that way. Bottom line: Get a bottle for now and a bottle for later. This one should be even better than it already is with a little time on it. Pingback: Sierra Nevada Narwhal | Drink. Blog. Repeat.